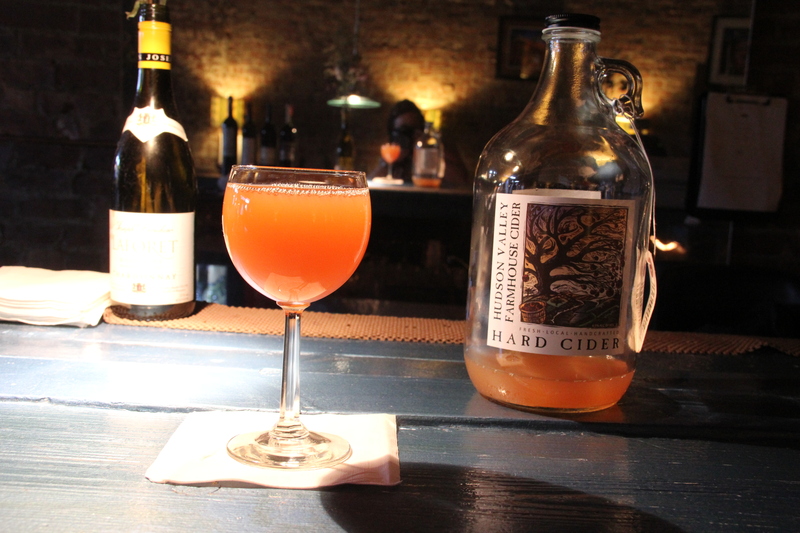 New York Cider Week is here! I rolled into the great state of New York after a lovely drive through New England on business, and I coasted down interstate 84 from Connecticut towards the Hudson Valley amidst a sea of red and gold leaves, stopping along the way for some farmstand fresh cider and donuts. In a way, this is home ground for me, at least in an ancestral-extended family sort of way. My extended family of great aunts, uncles, and second cousins lives right across the river from Beacon, and though I’ve never lived here myself, I’ve come out to visit over the years, making my way to the red brick house my ancestors built beside a mill stream, which is still inhabited by fellow Kennedys. I’ve always loved the Hudson Valley, and I’d love to have a reason to settle in here someday. As I drove into the little town of Beacon, I was surprised to find a full Sunday afternoon street fair winding down. There were antique cars parked along the street for people to admire and bands playing. 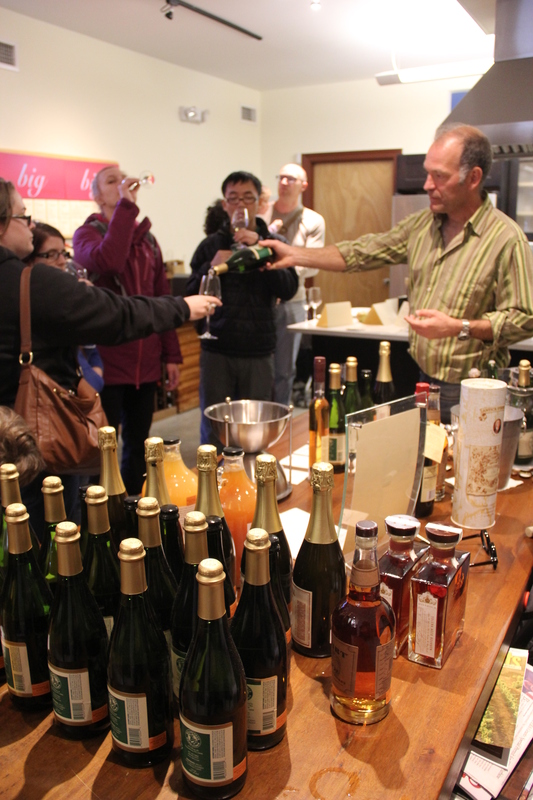 As I made it into the Artisan Wine Shop, I found an enthusiastic crowd of folks lining up for the free cider tasting. It was the last half hour before close, and the people behind the counter seemed pleasantly harried – they said they’d expected to be busy, but not THIS busy. 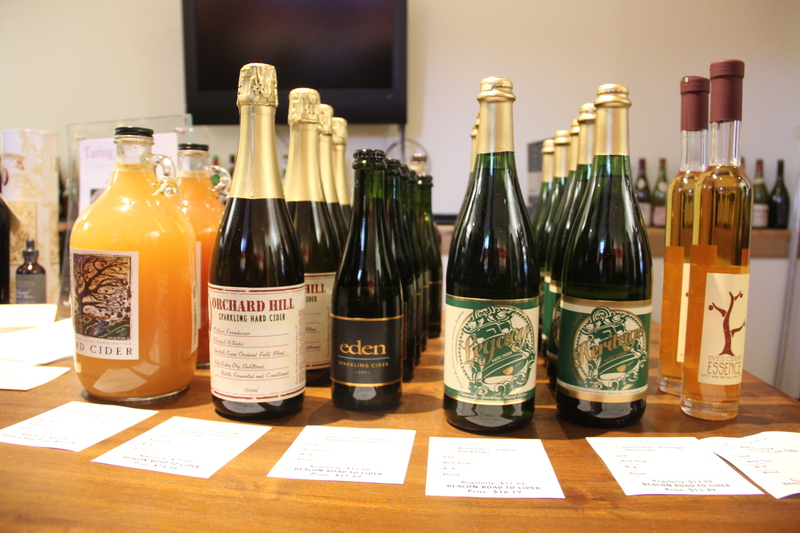 I tasted Orchard Hill, Eden, Bellwether, and Eve’s Ice Cider. All very nice – I particularly liked the Bellwether “Heritage” which was a still version. Sometimes I think the American ciders get really carried away with carbonation, both bottle condition / champagne style and forced carbonation. Some of the really delicate and rich flavors are much more enjoyable in still cider, in my opinion. Carbonation can either hide mediocre cider or really enhance a lovely cider. But sometimes I think enthusiasm for carbonated flare gets in the way of really good flavour. Something to consider. I found that the Bellwether Legacy sparkling cider was nice, but the Heritage still cider was even nicer. The shopkeepers said they were hoping that the event would help promote hard cider for their customers, and it sure seemed like they were doing a good job. I found their selection of other ciders (beyond the special sampling selection for the afternoon tasting) to be really great. A fairly wide display of east coast and Hudson Valley ciders – more than I have yet seen elsewhere. 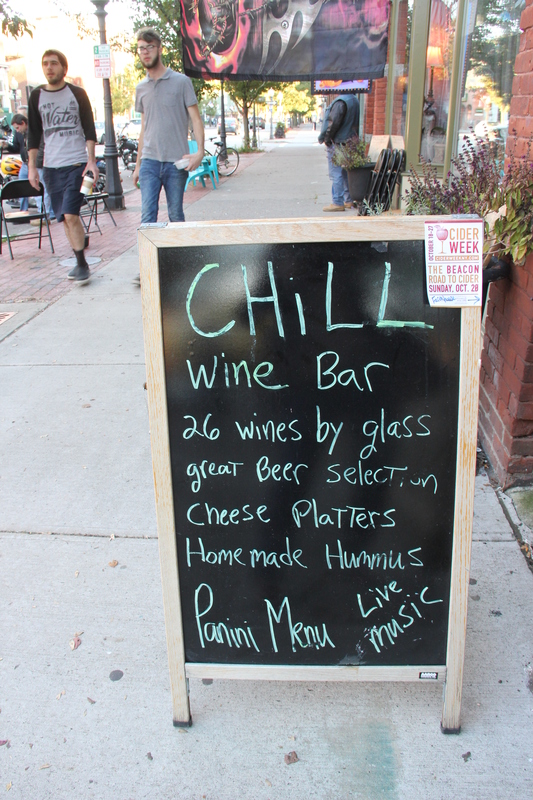 After making a rather eye-popping purchase (all in the name of research, my friends) I wandered over to the Chill Wine Bar, which was serving a few ciders as well. I opted for the Hudson Valley Farmhouse Cider from Breezy Hill Orchard. The wine shop had almost run out and didn’t have any left for sampling, so I was glad to get a chance to taste it at the bar. I’d noticed the bottles at the wine shop – growlers really – were bubbling away steadily, and the label indicated they should be refrigerated. I have never seen anyone sell cider that is clearly still fermenting before, so I was curious. I am almost certain it must have been pressed a few weeks ago – does anyone else drink cider this young? I admit I was perplexed. When I ordered it at the bar, I was surprised that it tasted almost exactly like sweet non-alcoholic cider, with a slight kick. I have never encountered a style like this before – especially in England where almost always cider is fermented over winter, ready at Christmas at the earliest and usually April or May. I would love some feedback. Is this a style or just an anomalous product? When I asked the shopkeepers at the wine shop, they said it was “scrumpy.” Friends, I have not encountered sweet partially fermented scrumpy before, but I am open to being corrected. Please enlighten me. At any rate, the Chill Wine Bar had gone through almost two growlers of this cider since 2pm, so it was doing good business. As I sat sipping my drink I overheard a couple – also drinking the cider – chatting about their attempts at cider making at home. Clearly the cider buzz is about at the home-makers are coming out for Cider Week. 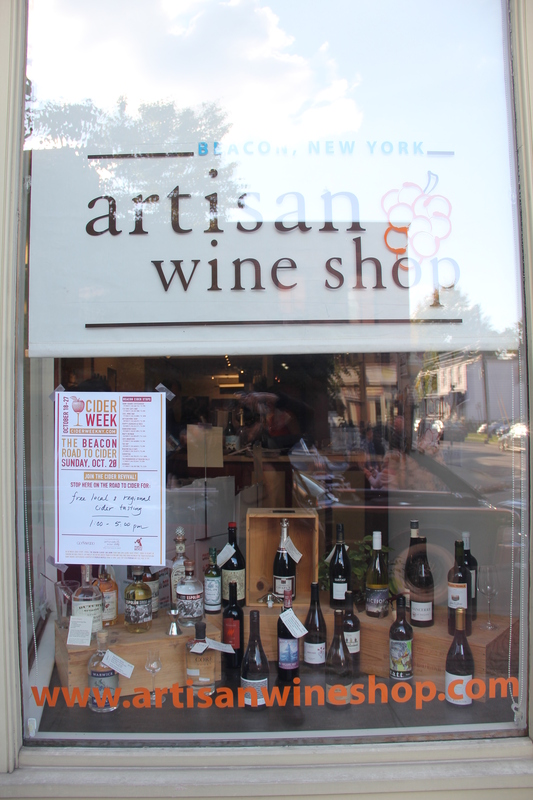 This entry was posted in Cider Week, Northeast, Uncategorized. Bookmark the permalink.